To provide our customers with the most up to date, reliable and user friendly electrical reticulation, power backup systems and cabling solutions, specially designed to meet the client’s requirements. To strive for service excellence within our field by utilizing the knowledge, expertise and personnel available within our company. 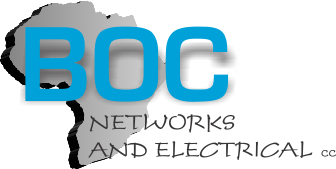 •	BOC Networks & Electrical cc is a dynamic company formed with the IT and mining Industry in mind. Our goal is to assist the necessary departments lift their service levels by ensuring their IT and network infrastructure as well as electrical reticulation is of the highest standard according to their needs and budgets. •	Our goal is to find the most reliable solution for the client, taking costs into consideration and consistently guaranteeing a high standard of workmanship with quality control and after sales support. •	We will assist in the design and implementation of all fiber, IT cabling, LAN and WAN needs including switches and wireless networks without compromising service levels. We believe in quality of service, therefore our clients are core and are given top priority.